As I mentioned in my last post, I’ve moved to the Chicago area and am now facing an hour’s train ride each way to work. To my surprise, my sister is a moderate fan of superheroes as well and she lent me her copy of Infinite Crisis: A Novel to read. I was familiar with the storyline and the previous event Crisis on Infinite Earths in name only. This is the first superhero novel I’ve ever read. When I was in my teens/early twenties I read a ton of fantasy books, mainly all of the Forgotten Realms series that was published at the time, as well as the Weis/Hickman written Dragonlance novels and Robert Jordan’s massive Wheel of Time series. One of the things I noticed fairly early on is how much is lost without visuals. 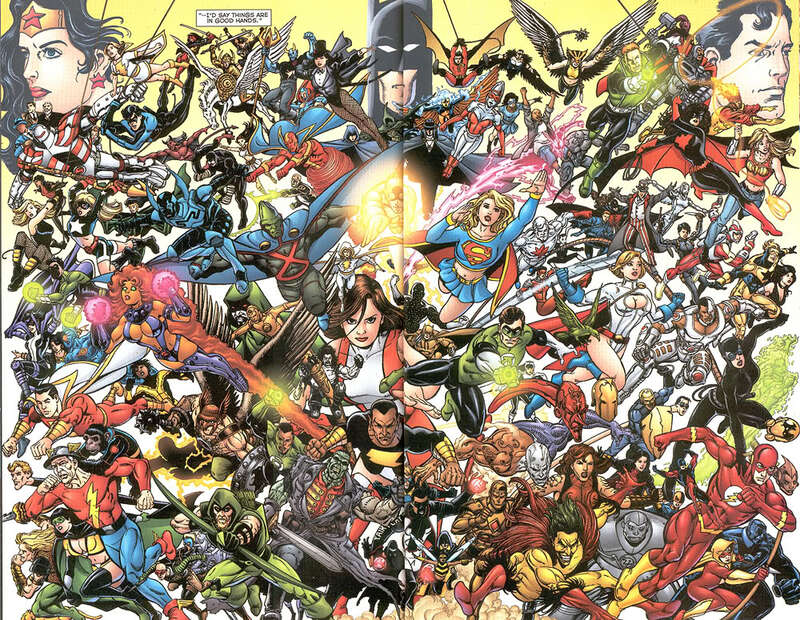 Comic books and superheroes are very much a visual medium. And I understand that fantasy can be very visual as well, but for some reason reading about superheroes without the visuals to back it up felt a lot more silly to me. Especially when you get to the fact that this novel covers a huge crossover comics event that features literally hundreds of heroes and villains and has about a dozen main characters. And on top of that, seeing Batman survive being strangled by some superhuman villain is one thing, but reading several times how he’s only surviving because of his armored neckpiece just sits the wrong way with me. But aside from a few qualms, I generally enjoyed it. The main thrust of the story is about how the three main DC heroes have somewhat lost their way. Batman has grown so paranoid of other heroes that he created an extremely advanced AI satellite called Brother Eye to watch them all, and of course someone else has corrupted it and now it is using nanomachines to infect citizens and turn them into an Observational Meta-human Activity Construct (OMAC), in other words superhero hunting cyborgs. There are thousands of them now and they are out hunting and killing meta-humans. And they are also used for observation, as when they recorded Wonder Woman killing the villain Maxwell Lord by breaking his neck while he was trapped within her Lasso. Brother Eye then sent that footage to all major TV networks, which created a public distrust of Wonder Woman and to a lesser extent, heroes in general. And Superman I believe was a part of a plot used by many of the Justice League where they took villains who had learned certain superhero’s secret identities and had their memories of that secret erased. This has created a reason for the supervillains to all team up together to take out the superheroes. And there’s also a group of three refugees from the last big event, the Crisis on Infinite Earths, where the entire multiverse was destroyed except for this one single universe. The three of them are inside a pocket dimension and are trying to bring back the multiverse, to some extent. I could go on and on and barely scratch the surface of all the multiple storylines and twists and turns, but if you haven’t actually read any of the comics, it’s much better to go in blind because there really are a lot of surprises and twists. Some of them are more surprising than others. There are plenty of action sequences in this book and I thought that the writing for these sections was done quite well, that was one area where I’m not complaining about the lack of visuals. That complaint mainly comes in during the descriptions of the costumes, which really slowed things down for me, they either slowed things down as I read the description of an iconic costume I know by heart, or spelled out the silliness of some of the costumes that are out there, especially many of the skimpy female costumes. This ain’t even the half of it. There is an absolutely huge cast of characters in this book which is both a blessing and a curse. It’s nice for some of the lesser known heroes get their chance to shine, and it was nice catching a few lesser known names that I recognized, but some of the heroes are downright silly like the Detective Chimp. Not only that, but with so many characters, the story has to jump back and forth between many of them and it’s sometimes harder to catch your bearings and remember whose thoughts your reading about. There’s also often not nearly enough time given to these new characters that are often just introduced so they can die a few pages later. Besides the fact that there are tons of heroes in this book, tons of them are getting killed off. Most of them are heroes that I only just heard about for the first time in this book, though there are several more recognizable names that bite it later on in the book. I will say again that overall I enjoyed reading this book. It’s by no means perfect, but when it gets to the good parts, they are really good, and the bad parts are often quickly passed over. It hasn’t caught my interest enough to go out and try to either sort through the back issues to piece together some of this event from the original comics or find out if there’s a trade paperback of the collected comics, but it was still an interesting read. I also don’t think I’ll try to track down any other superhero novels in the near future, which is why this not turning into a new category, merely a one-shot article. It was definitely an interesting experience and a change of pace. Now I just need to find more time to watch and review movies again. Until next time, this has been Bubbawheat for Flights, Tights, and Movie (and Book) Nights. Posted on October 21, 2012, in Blogs, DC and tagged batman, DC, flash, green lantern, infinite crisis, novel, review, Superhero, Superman, wonder woman. Bookmark the permalink. 5 Comments. Fine look at this, my friend. BTW, since you’ll have some time on your commutes, I do recommend trying out audiobooks. You can still stay in this superhero realm, as well. GraphicAudio offers “a movie in your mind” with their audio line. They even offer Infinite Crisis. Just a thought. Thanks. It’s funny that you mention that, I actually noticed the Infinite Crisis GraphicAudio when I was searching for the novel cover picture. I will hopefully get a usable laptop in the near future, I had an older one my parents gave me that stopped working, but it’s getting fixed. I don’t know if I’ll try actually watching movies, but it will give me time to write at least. Welcome back, Bubbawheat. Sorry it took me a while to swing by; busy week. I’m not surprised Infinite Crisis was a bit of a mess in novel form… would have been mighty hard to pull together a cohesive narrative from all that sprawl. It only “mostly” worked in comic book form. There was a third “crisis”?! Hearing its name is ringing a few bells in my memory, but from a somewhat outsider’s perspective it seems like a little bit of overkill. More than a little bit. “Excess” was definitely the word.